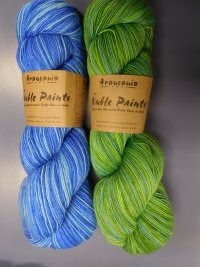 This gorgeous 75% merino / 25% silk yarn is hand dyed in some vibrant colors that complement the soft gentle Manos Fino (arriving shortly) colors of the same blend. 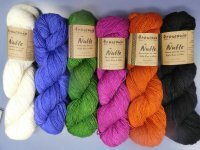 Recommended at 7 sts/inch, this yarn has a wider range of gauges than you'd think. 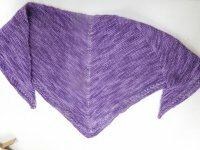 The shawl shown below , which used just 1 skein, was knit at a gauge of 5 sts/inch in garter stitch.